LiveWell™ hydrolyzed, type I & III Collagen Peptides are sourced from grass-fed, pasture-raised, Grade A bovine, and certified hormone-free and 100% non-GMO. 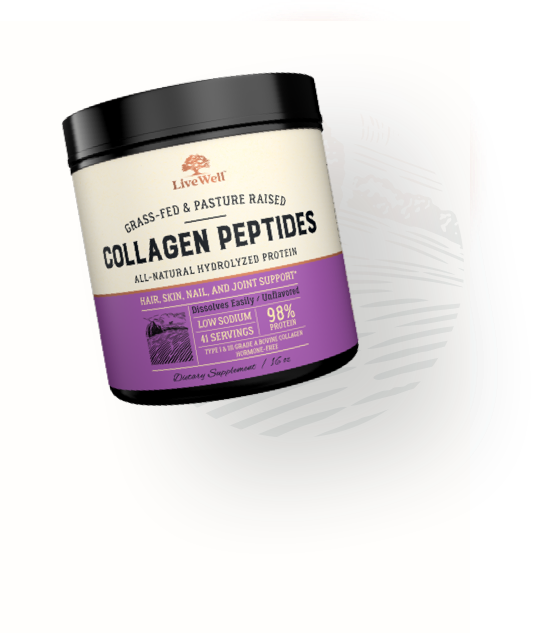 Containing 19 naturally occurring amino acids, Collagen Peptides are enzymatically formulated for enhanced bioavailability and absorption to support bone and joint health, strengthen hair, skin, and nails, improve gut and immune function, and benefit the body's overall cellular structure, so you can live well. Enzymatically formulated for enhanced bioavailability and absorption to support bone and joint health, strengthen hair, skin, and nails, and benefit the body's overall cellular structure, so you can live well. 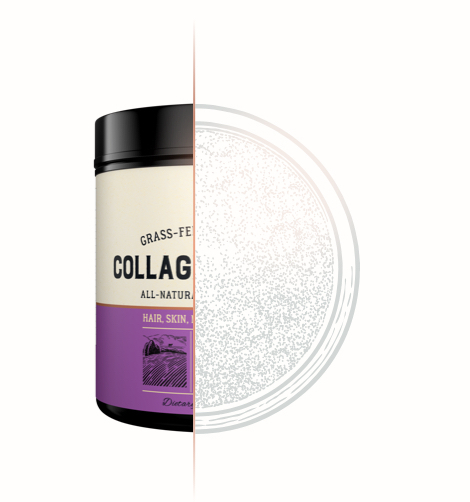 Collagen is the most abundant, naturally-occurring protein found in the human body and is the building block for your cells, tissues, and organs, making it essential for healthy bones, joints, skin, hair, and nails. As we age, we naturally lose collagen, and modern diets are less abundant in collagen, which can lead to stiffness, swollen joints, sagging skin, wrinkles, and more. Increasing your body’s reserves with hydrolyzed collagen can improve joint health, digestion, brain health, and give you more youthful-looking skin, thicker, healthier hair, and stronger nails. The benefit of hydrolyzed collagen is that it has been broken down into shorter chains, called peptides. The resulting powder is virtually tasteless and odorless, and its low molecular weight means you can easily stir it into anything you’d like, and it blends right in. We ensure our hydrolyzed collagen peptides are sourced only from grass-fed, pasture-raised, Grade A bovine, and certified hormone-free and 100% non-GMO because we know grass fed cows are happier and healthier. Free to harmful fillers and additives, our collagen peptides are the best way to counteract the effects of aging, increase flexibility, and rebuild and repair your health.